When you're shopping around for home massage products, keeping track of brands, models, and products is a feat in and of itself. It's enough to cause a hasty decision and just get something in the door, so you can grab a massage and decompress from the stress of it all. But whether you're looking for a massage pillow, a back or neck massager, or even something along the lines of one of the many available heated pads, we've pulled together a review of Zyllion ZMA-14-Bk cushion that will hopefully help make your decision easier. It's important to compare models and brands, so we've looked at two of the top rated models according to multiple online polls and reviews. If you're on the market for truly the best massage cushion out there, and you want one that covers the full back body, seat to neck, the Zyllion ZMA14 is a great option. Zyllion is a well respected brand name with a good reputation and loyal customer base. Massage pads are excellent alternatives to chairs for their obvious benefits of portability, ease of use, quality massage functions and features, and of course, price. We compared the ZMA14 with the Homedics MCS-510H, read the reviews, and compared the benefits and pros and cons below. We've also thrown in the review of some of the other Zyllion products that are smaller and designed for specifically targeted areas of the body. If your muscles are sore and tight, or you're tense from a stressful day, relaxing into a heated massage feels like sheer bliss. Heat is soothing to your body, and it helps to decompress your mind and ease you into a state of calm. We all love a hot shower, and there's a reason steam rooms are in so many health clubs. But we can't take either with us, so easing back into a heated massage cushion sure feels like the next best thing. The Zyllion ZMA14 delivers Shiatsu massage accompanied by a heat option. We love the heat feature on this model because you can opt to turn it on or leave it off, which is sometimes unavailable in a chair or back massager (many are just on). You can also heat up the back, neck, or both, which is great if you like feeling heat on your neck only, or it helps with sore tight muscles in your back, but you don't want it on your neck. This way you can personalize your massage and aren't locked in to a cookie cutter massage that you get from some other models. Heat is often just a personal preference, but it also has therapeutic benefits. It feels good, of course, but it can also aid in breaking up those tough knots you get from stress, exercise, or work. It relaxes your soft tissue and muscles, making you feel less stressed and strained, and it increases relaxation, so you feel more mobile and flexible. Heat also calms your mind and senses, giving you an overall sense of wellness and calm. Nothing rejuvenates you more from mind to body than a soothing heated massage. Lots of massagers offer Shiatsu type of massage, but you can customize this cushion to the type of massage that you like best or that soothes an area that is tight, overworked, or sore. The rollers are adjustable, so you can either let them roll up and down your back, which feels great, and gives you more of a traditional type of massage that relaxes your back and neck muscles and entire body, or you can set the rollers to hit just certain areas. You can also choose between regular rolling or rotating, which feels great if you need targeted pressure on a sore tense area. So, if you tend to develop knots in your neck, low back, or behind your shoulder blades, for example, you can aim the massage rollers to hit those exact areas. There is almost nothing better than the feeling of deep, direct rolling or rotating massage on a sore, tight muscle area like this. The only thing that comes close is heading to the day spa. 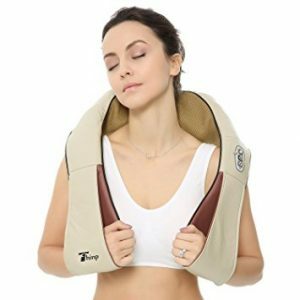 If you carry stress in certain areas of your neck or back, or you just like the sensation of a good, deep tissue Shiatsu back or neck massage, this cushion delivers a heavenly transformative experience and feels relaxing any time of day. It's a great way to kick off your morning routine or enhance decompressing with your feet up at the end of a long day. 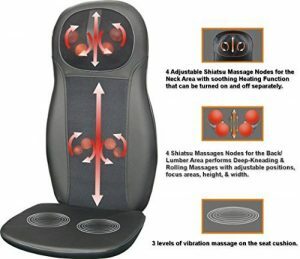 To complete the experience, you can choose between three levels of vibration massage for the seat portion of the cushion. This is a great way to get a full body shake out on those tired muscles from neck to legs, or to target the glutes you've been overworking all day at the office. 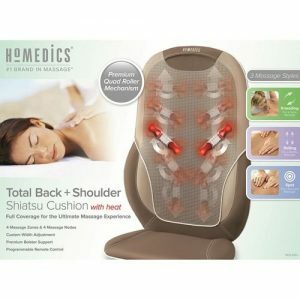 The Homedics MCS-510H is another good massage cushion and is somewhat comparable to the Zyllion, with a few exceptions. It looks great and is of course portable as well. The heat feature, however, is not as customizable. You can opt to heat up your back to accompany your preferred style of massage, but you can only have heat on your back. You don't get the option of heat (or massage, for that matter) on your neck. The massage features themselves are good on this model. If you like the traditional rolling massage, you (and your back) won't be disappointed. You can choose rolling, kneading, and even spot massage for targeting those sore, tight areas, and easing your way into calm and peaceful tranquility. Soothing away stress and tension is at your fingertips with this cushion, literally, because you can choose all your options and customize your experience with the remote control. You get the full back and shoulder deal with the Homedics cushion, and if you like higher intensity some days and a little gentler massage on others, you can have it all by choosing whichever level of intensity suits your mood or pain level. You aren't locked in to vigorous, so if you want to go with mood or level of discomfort, you can have it your way. While both the Zyllion and Homedics are good products that get high average customer reviews, the Zyllion just packs a few more features and options into their cushion that are worth a lot when you're going after ultimate relaxation, stress & pain relief. If you are looking for something a little smaller, better for targeting specific areas, and even more portable, there are some great massage pillows out there. 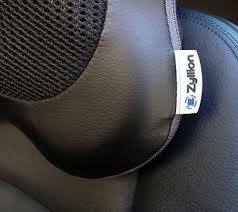 This Zyllion massager is the perfect neck and back massage pillow. This little unit has 3D deep tissue Shiatsu massage rollers that change direction every minute automatically. If you want a product that will out-soothe, out-relax, and out-decompress just about any of the others, you are in luck. This offers big relaxation in a small package. Grab this at the end of long day or a hard workout, and you will be transformed to calm town in no time. It has a heat feature to accompany the deep tissue massage that you can turn on if you want, so if you have knots or tight, overworked muscles, you can loosen them up more quickly. The heat also gets your blood circulating more efficiently, so you not only feel better more quickly, your muscles can recover more quickly. This is great if you spend a lot of time in the gym. Last but not least, we took a look at the Zyllion ZMA-13 Shiatsu pillow massager. Heading down the line from biggest to smallest, this compact little pillow is excellent for delivering a relaxing neck massage. If you have headaches, carry a lot of stress in your neck, or just suffer from tight neck muscles, a massage pillow will change your life. This pillow utilizes the Zyllion signature 3D Shiatsu massage technique, which really is quite amazing for such a small pillow. You will be relieved from stress, and transported to utter relaxation with a session on this massage pillow. It also features heat, which feels great on the back of the neck, and helps calm your senses. This is good for easing tense muscles that can accompany headaches if you have them. And it will quiet your mind while relaxing your head and neck, making you feel like you're drifting weightless in a float spa. No matter which type of massager you're after, from a larger, full-back-body capable cushion, to a small and targeted neck pillow, Zyllion and Homedics offer some excellent options. While we find Zyllion ZMA-14-BK comes out on top in it's categories, you wouldn't go wrong with the Homedics runner-up. These are affordable, feature-rich models, and all available on Amazon. No matter which of those 2 model you choose, you will be just fine. It's an investment in your body and mind that is well worth making.